Mansoor Mahmood Ashiq is MBA from the City University Business School, London, UK and has 18 years of experience in Marketing, Strategic Management, Teaching and Training. He is working as an Assistant Professor at the Institute of Business & Information Technology (IBIT), University of the Punjab, since 2006. 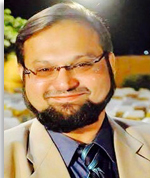 Formerly, he has worked as an Assistant Professor at COMSATS, as a Hon. Assistant Professor at National University of Science & Technology (NUST) and as a Research Associate at Lahore University of Management Sciences (LUMS). He has also taught Executive MBA courses at GCU and undergraduate courses at Kinnaird College & PIFD. He has given lectures on Business Strategy, Marketing and Career Counseling at diversified institutions. His teaching, research and training interests are Business Strategy, Leadership, Marketing Management, Communications, Entrepreneurship and Islamic Business Philosophies. He has co-authored a book on “Branding of a Political Party Worker in Pakistan”.